McLaren may not have won the F1 constructors’ championship for 13 years, but it’s certainly not for the lack of young talent. 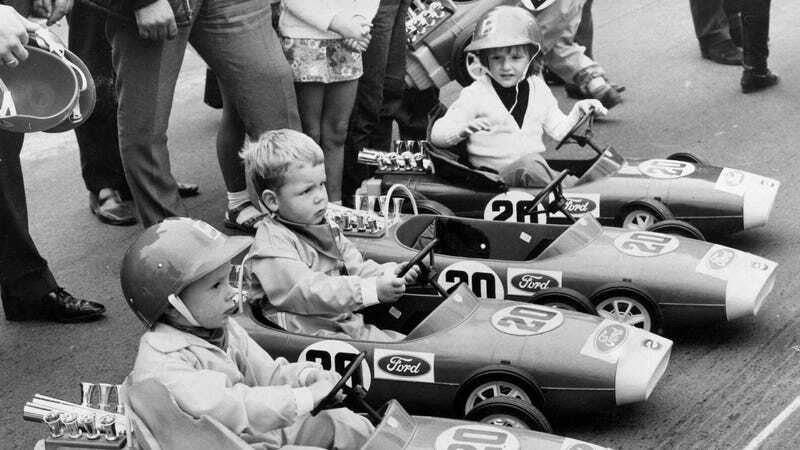 Pictured here is a pedal car race for the children of Formula One people from 1969, and the girl in the top car, team founder Bruce McLaren’s three-year-old daughter Amanda, had serious competition. The scene was the 1.35-mile Mallory Park circuit in Leicestershire, and Amanda McLaren was joined for the race by Cosworth DFV engine designer Keith Duckworth’s son Roger in the middle car. I don’t quite know how I ended up in the race, but I remember that I won it :-) I think it was just a race for all the kids of the drivers, under a certain age. I got to sit on the shoulder of Jackie Stewart with my winning trophy in hand. Not a bad childhood memory by a long shot.